China has arrested activists and placed others under increased surveillance to stop them from marking the anniversary of the Tiananmen Square crackdown. Searches on social media sites have also been restricted to try to prevent any reference to the 1989 events. The foreign ministry expressed "strong dissatisfaction" over a call from the US to free those still in prison for their involvement in the protests. In 1989, the army shot dead hundreds of civilians rallying for democracy. Beijing says the June 1989 events were a counter-revolutionary revolt and defends its response. The Communist Party still prevents any public remembrance of the event. 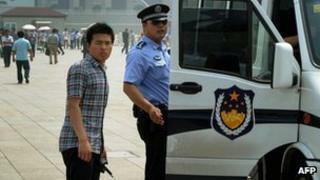 On Sunday, the US government urged China to free all those still in prison after the crackdown on protesters. It called China's "violent suppression" of the Tiananmen Square demonstrations a "tragic loss of innocent lives". From the capital, Beijing, to Fuzhou on the east coast and Guiyang in the far south-west, Chinese police have moved to detain and pressure activists. Hundreds have been rounded up in Beijing to prevent them from marking the anniversary, rights campaigners told AFP news agency. A small group of elderly men who organised a protest in a park in Guizhou a week ago have been rounded up, says the BBC's Damien Grammaticas. A human rights group, the Dui Hua Foundation, estimates that fewer than a dozen activists arrested in the 1989 Tiananmen crackdown remain in jail. Hundreds were rounded up at the time. Those left in jail are not students who led the protests, but people who committed arson or attacked martial law troops, Dui Hua executive director John Kamm told the Associated Press news agency.